Pay a visit to this award-winning shop. After many years working for some of the finest cheesemongers in France and England, Andy & Kathy set up their small cheese shop in 2012. Quickly winning many awards [click here for details] including World Cheese Awards Cheesemonger of the Year, and enjoyed by Royalty, this special cheese shop deserves its position as of one of the best in the UK. Specialising in a small range of cheeses, The Courtyard Dairy really concentrates on its ethos to support and champion farmhouse cheese-makers within the UK, with an emphasis on unpasteurised, raw milk cheese from single herds. These rare, hard-to-find cheeses are expertly aged on-site to add an extra depth of flavour. Many of these cheeses are unique; all are made by hand by true artisans. You’ll experience, taste and enjoy ‘proper’ cheese. 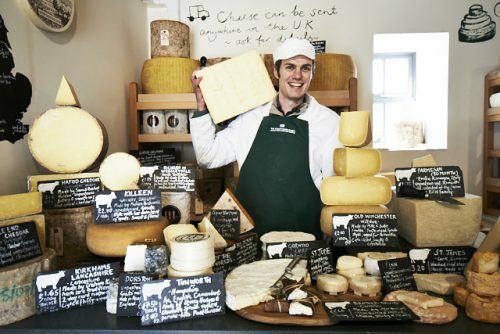 Find out more about the background and ethos to the Cheese Shop here.